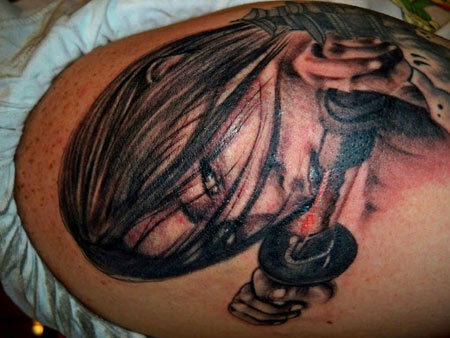 There is no better way to flaunt body art than through tattoos. 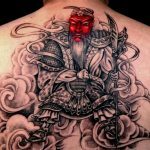 Tattoos are the emerging trend in body art, both among the youth and the older generation, as they are extremely attractive. They are created by injecting bio-ink under the dermis layer of the skin and unless surgically removed, they last a lifetime. They may be in black or colored ink, or even in UV ink that glows in the dark. This is a black and white image with red highlights. It shows a samurai chief with a beard, holding a spear. He is dressed in flowing robes and holds a feathered dream catcher in his other hand. The background of the figure is cloudy and highlighted with gray ink. The face of the samurai is highlighted with red ink, possibly to show rage. 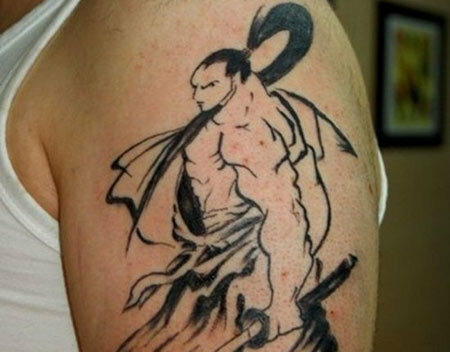 This tattoo is entirely black and white, and is not strictly a Japanese tattoo. 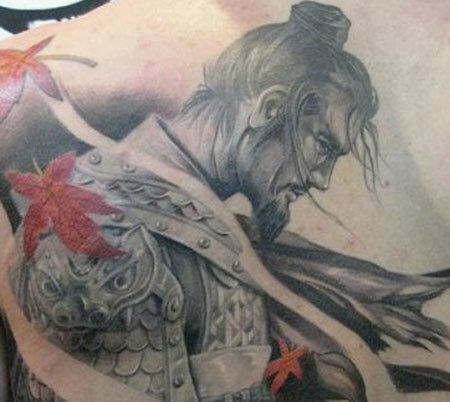 Nevertheless, the tattoo shows the face of a samurai. The samurai has head armor on; it consists of two horns and perched atop the horns, is a human skull. The samurai’s face is enraged and he is baring his teeth. 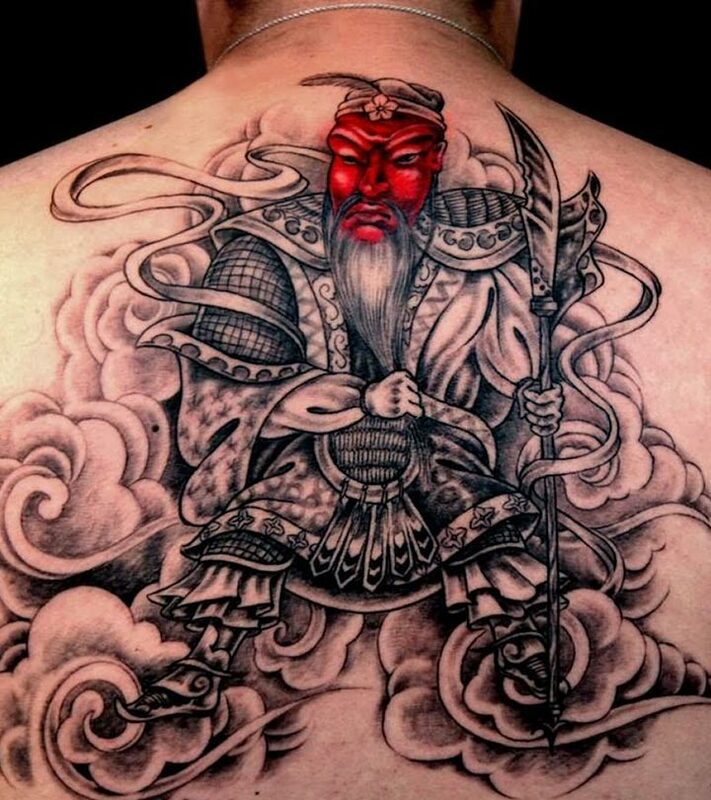 This tattoo is in black and white with orange highlights. 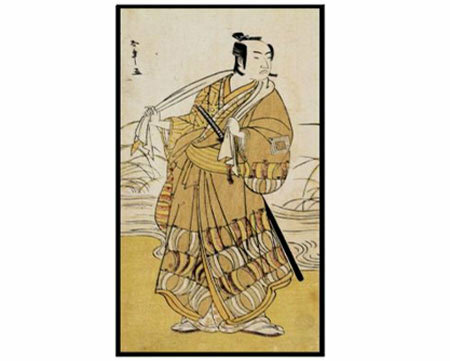 Japan has a patriarchal society; hence, finding a woman samurai is extremely rare. 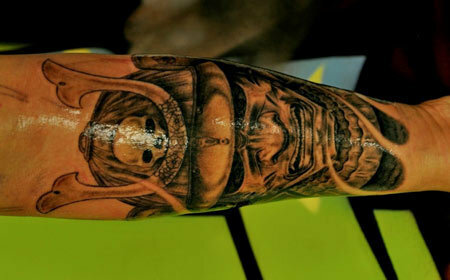 Nevertheless, this is a tattoo of a woman samurai. It shows only her face that is half-concealed by the locks of her straight hair. She is holding a sword close to her face and drops of blood can be seen as residue on the sword. This tattoo is in black ink and meant for the back. 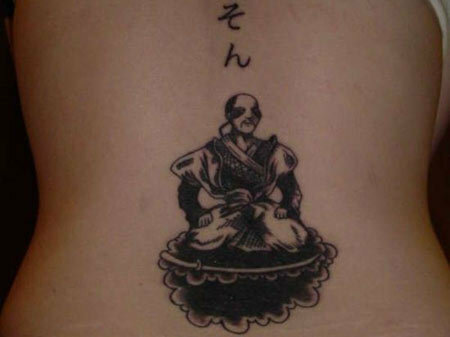 The top part has kanji or Japanese letters, and the lower part shows a samurai, meditating. He is sitting on his knees with his hands on them and his eyes are closed in meditation and concentration. He appears to be sitting on an elevated platform. 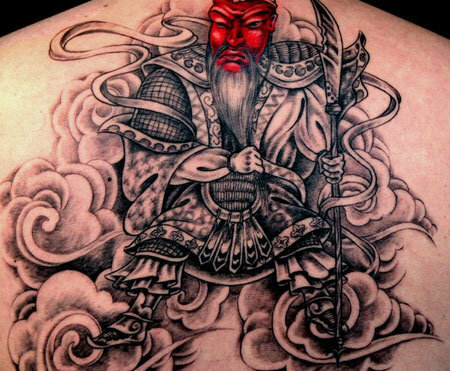 This tattoo is in red and shades of maroon ink. It shows a samurai in the middle of a fight. He is in armor and his body is shielded heavily. He has a sword in his hand that he has raised, as if about to strike and his foot appears to be moving forward with the motion. 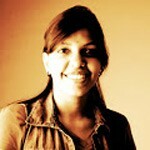 The background has red stripes. This tattoo is in full color and from a painting. It shows a samurai, with his head shaven and a thin, long beard. He has robes in colors of beige and tied it with a yellow sash at his waist. He is holding a lethal samurai sword and is looking to his side. Samurais sometimes fought on horses, and this is a depiction of the same. 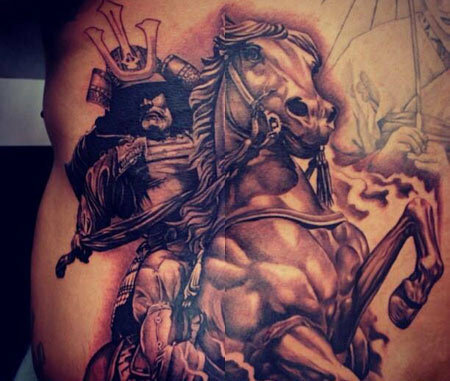 This Japanese samurai tattoo shows the horse, with its head in focus as it gallops. Seated on its back is the samurai, wielding his sword, covered in full regalia of his metal armor. This tattoo is in black ink and the flowers are in red ink. It shows the side profile of a samurai standing with his head bent, in metal armor. The red blossoms that are found in autumn seem to be blowing over him. This tattoo is in black ink, and relatively simple and minimalist. It shows the bare-bodied samurai with his hair tied back and his robes, flowing. He is holding a sword. 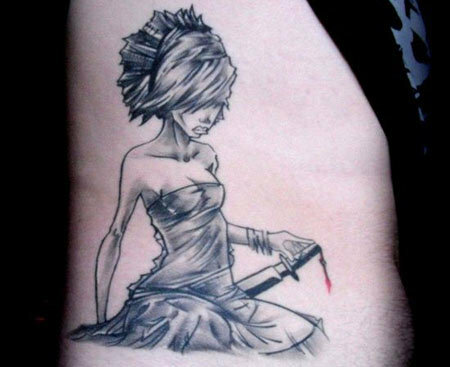 This tattoo is of a woman samurai from a manga comic. She is in a white robe and is holding a sword. This serves well as an arm tattoo. 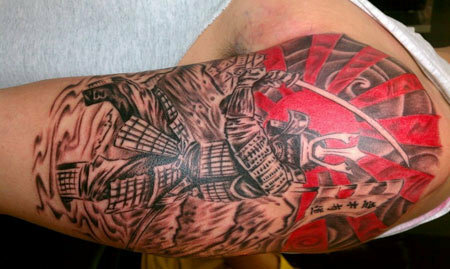 Hope you liked these samurai tattoo designs. We shall be back with more!